You may be familiar with the Big Buck Hunter bonus level where you pump a few dozen rounds into salmon flopping out of the river while grizzlies look on. This is not an especially good bonus level (I prefer the one with the basketballs or the electric eels), but it would be much worse if you needed to shoot elderberries. 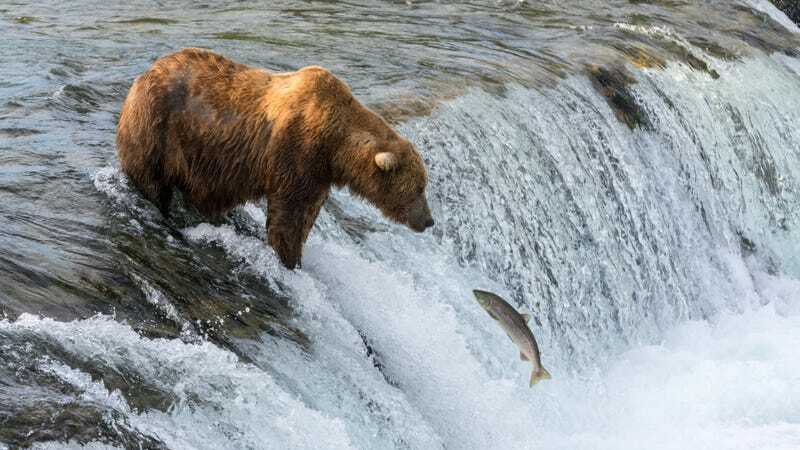 The researchers surveyed a Kodiak brown bear population in Alaska, calculated elderberry ripening dates, analyzed bear poop and estimated salmon abundances to create a picture of how the relationships changed over time. It seemed to them that the more ripe elderberries there were near the stream, the fewer bears went hunting for the fish. Warmer years move the elderberry season earlier to overlap with the salmon species, so the bears chose the less calorie-dense but more nutrient-rich elderberries over the salmon protein and fat. More importantly, the analysis suggests that this overlap will occur more often. “If these trends continue, by 2070, the average onset of berry availability would occur during the average peak of salmon availability,” they write in the paper published yesterday in the Proceedings of the National Academy of Sciences, implying that bears could pick berries over salmon more often in the future. Yong’s story in The Atlantic includes speculation as to what this means for the bears: Maybe they’ll be worse off during hibernation from switching to a less fatty food, for example. Or maybe other animals like gulls and smaller fish will miss out on the salmon scraps the bears leave over.